Banana pudding is a Southern classic, an easy comfort food dessert put together in a bowl, chilled and later spooned out into small bowls. Nothin' wrong with that. It's how I usually make it. But sometimes something a little fancier is called for, and that's when I make it in a springform pan so I can serve it in tidy slices. 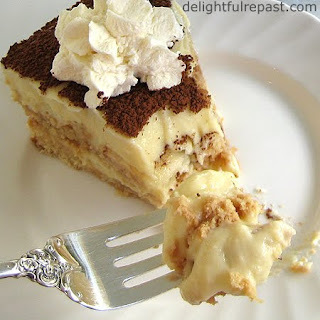 It was when I decided to use a little alcohol on the vanilla wafers and a dusting of cocoa powder on the top, as with tiramisù, that I started calling this dressed-up banana pudding "Bananamisu." A lot of people top their banana pudding with meringue, but I prefer whipped cream. Wish I didn't. Meringue would be a "healthier" choice. And, sure, you can use boxed pudding mix, but homemade custard is so much better. And it allows me to cut back a little on the sweetness. After all, the custard is layered with sweet cookies and sweet ripe bananas, how sweet does it need to be? Just sweet enough! If you have a nice heavy-bottomed 2-quart saucepan, you can make the custard right in the pan. But if you're new to custard, making it the double-boiler way will help you avoid curdling the eggs. Either way, it takes a bit of time; so I just pull my kitchen stool up to the stove and settle in for some serious stirring. If you didn't grow up in the banana pudding tradition, maybe you want to start one now? 1 In top of double-boiler, whisk together sugar, flour and salt. Gradually whisk in milk. Whisk in egg yolks until thoroughly combined. Cook, uncovered, over boiling water, stirring constantly until thickened (which might take 10 to 15 minutes; should register 160 degrees Fahrenheit on instant-read thermometer). Remove from heat. Whisk in butter and vanilla. 3 To serve, run a knife around edge and release pan sides. Slice into 6 or 8 wedges. Just before serving, whip cream with sugar and vanilla. Pipe a rosette of whipped cream onto each wedge. Garnish with vanilla wafer crumbs and shaved chocolate, if desired. My husband loves banana pudding, I'll have to try this. Thanks, Mrs. Tuna. Hope your husband likes it. Mine loves it; he's ready for another one. Wow, Jean, that looks fantastic!! I love banana pudding, but I would love this even more!! Thanks, Jenn! I hope you'll try it soon. Jane, this pudding looks absolutely gorgeous! I really fancy this now. You have inspired me! I also run a food blog, it's in Finnish but you can translate it with google. I mostly specialise in Indian veggie food, though, but sometimes I bake, too. Thanks, Anna! I'm sure you'll like it. What's not to love about custard, cream, bananas and cookies? No I don't think your photo should have been rejected, it looks so delicious! One difference I noticed about your picture in relation to all the others on the site is that you actually have a bite of food on the fork. None of the other pictures do. It might be that if you had just left the fork on the plate beside the pudding, without a bite, it may have fared better. Just an observation. I still want to make this delicious recipe! Richard, thank you! I've had other "bitten" things accepted, so I don't know if that was the problem. I just thought it was so much better a photo than some of the others that were accepted! Oh well ... glad YOU liked the photo! And I hope you'll enjoy the pudding as much as we do. Thank you! I hope you'll make it soon. Thanks, Gina! Hope he likes it. My husband loves it (and he always said he didn't like bananas!). Yeah, I leave out the rum when kids are on the guest list. Even though it's a teeny tiny amount just for flavor -- don't want them to developing a liking for the flavor! Good grief, this looks delicious! Thanks, Judy! You'll love it! Sweet Mimi, I'd be happy to! Thank you! I'd love to have a chat over coffee! Thank you so much. And Pins and shares are soooo appreciated! Oh my, this looks so yummy. I love banana pudding. I have to try this. Thanks for sharing your recipe. Trish, thank you so much! Guests are always pretty wowed by this one, I must say.